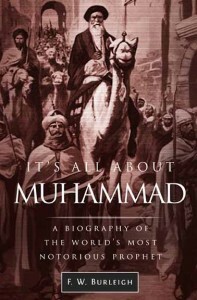 ANYONE WITH KNOWLEDGE OF ISLAMIC literature has to be honest about this: There is nothing in the canonical literature that shows Muhammad recruited children to fight his battles. At the battle of Uhud and on other occasions youngsters ran up to him to volunteer, but he sent them away as too young. He made an exception or two for physically precocious boys, but the rest he sent home to Mama. 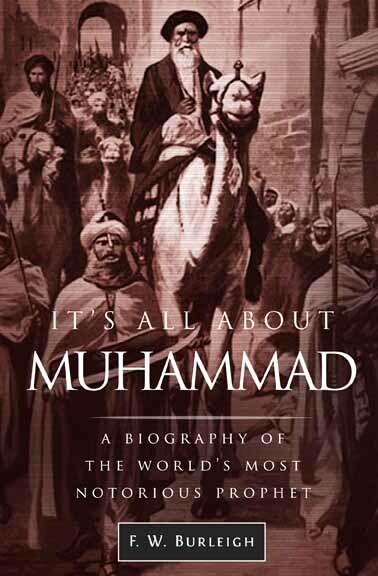 Muhammad was a mass murdering thug, an assassin, a plunderer, an enslaver—an evil man by any objective measure, and he unleashed a system of totalitarian evil that has plagued the world for 1,400 years. But ISIS, Boko Haram, and other groups that follow his example have managed to outdo their role model in evil, no small accomplishment: As recent videos show, they are now using mere children to do the dirty deed of slaughter. ISIS just gave proof in a video showing a boy–not even ten years old from the looks of him– shoot two men who had been accused of spying on ISIS for the Russians. 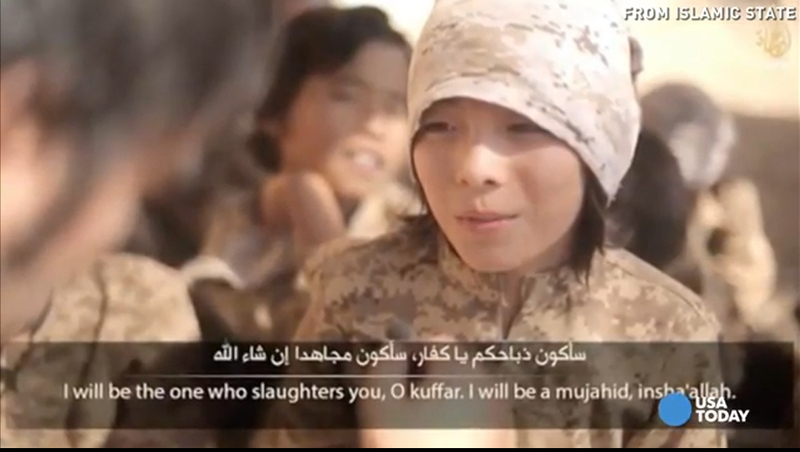 The boy was selected by ISIS as their executioner. After a bearded adult in military garb reads the accusations against the men, the boy steps forward and puts a bullet into their heads, and after they have slumped over, fires more rounds into them. The video ends with the boy thrusting the pistol in the air in triumph. And why not? He has just made the most noble of the ranks of Muhammad’s followers. He has become a killer in the cause of Allah, a made man of Allah with a guaranteed spot in paradise. No wonder the child’s face is so joyful. He believes everything his handlers have put into his head. Hamas has a history of showing Palestinian children with suicide belts strapped to them, and there are videos galore on the Internet of the children of Gaza repeating the hate speech of their elders against Israel and Jews and America; young Palestinian teenagers have blown themselves up in suicide missions. But even Hamas has not yet videotaped and publicized such a cold-blooded crime committed by one of their children. about this are given. His mission was to get close to a certain person, presumably someone the Russians considered of importance within ISIS, and inform the FSB about him. He was also to gather information about fighters from Russia. The video cuts to a desert scene and both are on their knees, their hands tied behind their backs. They appear resigned to their fate. They were lapsed believers but have found their faith anew, and their faith requires they pay with their lives in order to spare them the fires of hell. This was one of Muhammad’s ideas that he indoctrinated his followers with: Allah was merciful with people who confessed their sins and accepted the punishment of this world–the punishment Muhammad imposed. By going through punishment in this life, Allah in his mercy would spare them the punishment of hellfire in the hereafter. Thus they wait with apparent calmness for redemption through execution. A sweet face, but a mind crammed with hatred for people who refuse to believe the nonsense that Muhammad claimed about himself. head with a spray of blood as it exits—certainly likely with a bullet fired from an AK-47, or even a 9mm handgun. You don’t see any blood here, but the impact of the bullet on the first victim is clear. Hard to fake something like that. What is likely is that given his slight build the boy was given a .22 caliber pistol for the job. Unless you look closely at the bore, such pistols all look the same regardless of caliber. Small calibers kill just like big calibers, but a .22 round seldom passes through the body. ISIS has no reason to fake such a thing. The men confessed, the punishment was death. ISIS is on a mission to terrorize the world because it has world conquest as its ultimate goal. 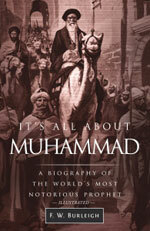 Its adherents follow the methodology of terror Muhammad perfected 1400 years ago. It worked back then, and they believe it will work again today. Certainly nothing can be more terrifying than the sight of a mere child happily committing such an atrocity. Or speaking the following words: “I will be the one who slaughters you, O kuffar (infidels). 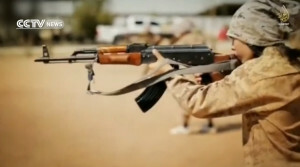 I will be a mujahid (holy warrior), Insha’allah (God willing). 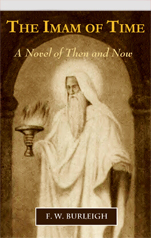 Muhammad had a genius for harnessing the energy of the dark side of human nature to further his cause of imposing his idea of God on people who resisted him. Islam is all about him and his Koran and the example of his behavior. His followers continue to harness the dark side of human nature in ever darker ways. Because violence is central to Islam due to the fact it was central to Muhammad, it will never be possible to get rid of Islamic terror without getting rid of Islam, since Islam is all about Muhammad.